Would you like to enrich your soul in a family oriented and friendly atmosphere? 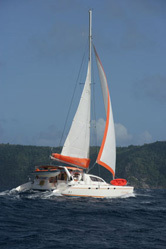 If yes enjoy the stress free life on the Catamaran Cleo! On the 47 foot Catamaran, we offer sporting and luxurious sailing tours in the most beautiful sail lanes of the Caribbean. From Trinidad over Barbados, Puerto Rico to Cuba absolute relaxation and recovery with a service which won't let any wishes go unrealized. The 2001 built Catamaran has a length of 14 meters and a width of 7 meters. With 4 cabins and air condition, Cleo offers you a great atmosphere. Inclusive: Skipper, Breakfast, Snack for Lunch and Dinner. To pay at destination : Check In and Out, Customs and Immigration, Marina or Mooring Fees, drinks.